To show how Christianity demeans people who believe differently as “lost”, and how it demeans its own members as “unprofitable”. For this lesson, Jesus has a few parables about how to treat those who are “lost”. Right off the bat, I have a problem. As an ex-Mormon and ex-Christian, I don’t think of myself as lost, and I find it insulting that Christians learn to portray me that way. I could think of Christians as “lost” — what else am I to call someone who ignores and denies the good in this life because they’re busy working for the next — but I don’t really think that. I think we’re all doing the best we can with the knowledge we have. Isn’t that a more respectful way of working through our differences? we’re supposed to be happy for them… when they come back to church. But that’s about it. Until they do, Jesus doesn’t have too many ideas. Could this be why Mormons are usually so bad at relating to former members? Let’s start with the Parable of the Lost Sheep. Luke 15:4 What man of you, having an hundred sheep, if he lose one of them, doth not leave the ninety and nine in the wilderness, and go after that which is lost, until he find it?15:5 And when he hath found it, he layeth it on his shoulders, rejoicing. Ask: Why would members esteem one person who comes back over ninety-nine who never leave in the first place? Answer: When someone leaves, it places members in an awkward situation. They either have to think that the person was wrong to leave, or perhaps — gasp — acknowledge that they had a point. But if that person comes back, the conflict is resolved. Of course that person was wrong to leave — by coming back, they’ve admitted it themsleves! It must be tremendously validating when someone returns. The LDS lesson manual continues this theme. Ask: What do we call a religion in which members monitor and report each other for trivial infractions? This next part concerns child abuse. 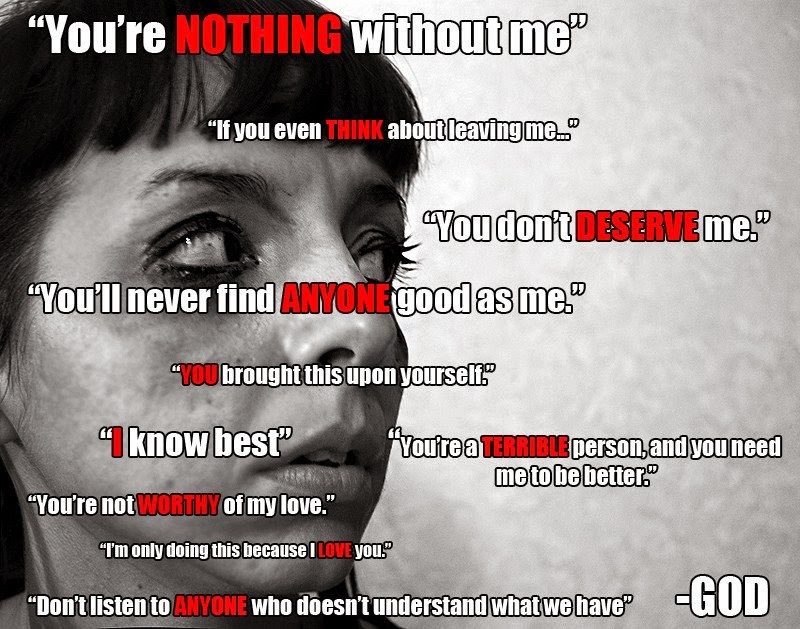 It’s not something I’ve been through, but many people have, and worse, the abuse has happened in a religious setting. I’m going to try to be as sensitive as I can about this, but please be aware if this is a triggering issue for you, and I’d appreciate seeing your thoughts in comments. Jesus speaks of offenses against children, saying that they’re inevitable. He’s only an omnipotent being — what can you do? Nice try, Jesus, but these are just words, not deeds. Ask: If you were an all-powerful being, and you saw that this was happening to a child, what would you do? Possible answers: Drop the offender with a non-suspicious heart attack, cause amnesia, change the offender’s mind like God did to Pharaoh. Ask: What does God do instead? Answer: Sits and watches, and threatens the offender with punishment later. When I bring this up to believers, their answer usually revolves around agency. It’s regrettable that this happens, says the believer, but God refuses to abridge the agency of the offender. My question then becomes: What about the child’s agency? What about their agency not to be abused? Why is the offender’s agency the only one’s that gets respected here? If this isn’t good evidence that no god exists, then it’s definitely good evidence that this god isn’t worth worshipping. While I’m on this topic, could I put a word in about bishop’s interviews. LDS bishops — generally men from the community with no training in counselling — routinely interview adolescents in closed-door sessions, in which the young people are quizzed about their sexual behaviour, including masturbation. This needs to end. We could also argue that religion itself is a form of child abuse. 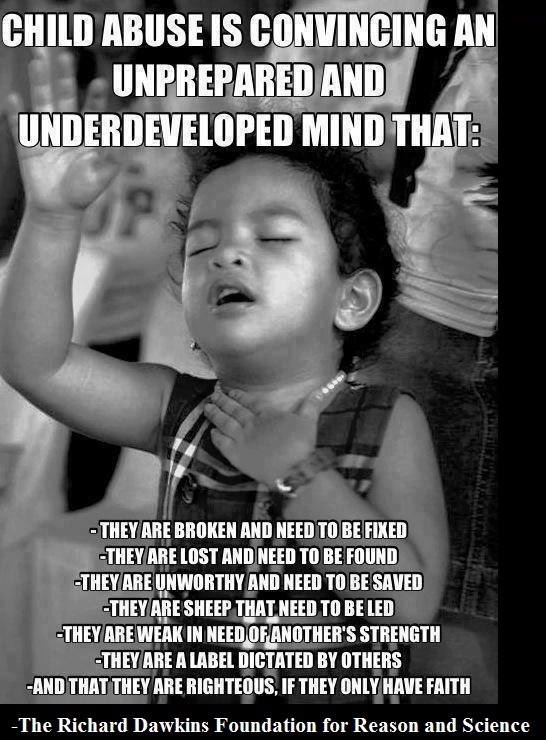 Taking the mind of a child, and diverting it toward supernaturalism is a terrible path that can take years to undo. That’s not to equate sexual abuse and spiritual or intellectual abuse — given the choice, I’d take the spiritual / intellectual abuse I got, instead of the sexual abuse I didn’t get. But it’s worth pointing out that there are different forms of abuse, and even the non-sexual kinds can be damaging. So it appears that Jesus has no trouble disparaging people who believe differently as “lost”. But he also doesn’t have very much encouragement for those who do believe. In other words, don’t think you’re good just because you did what you were commanded. You’re still unprofitable. This idea has a function. After all, we want people in church to feel good, but not too good. That why we hear so much about avoiding ‘pride’. So Latter-day Saints are hearing this in church this week, and thinking, yep, I sure am unworthy. Keep them down. That’s how you keep them coming back. Treat ’em mean, keep ’em keen. This is classic abuser behaviour. I’d like to offer some good news to my Christian friends. You don’t merit the abuse that Jesus and your religion dish out. You’re better than this. This scripture seems to imply that one can find spiritual answers inside oneself. That’s very dangerous to a hierarchical top-down model of spirituality, which is why Bruce McConkie fought it so hard. Watch as he turns it into an affirmation of the church system. “One of the heresies which prevails in a large part of modern Christendom is the concept that Jesus did not organize a Church or set up a formal kingdom through which salvation might be offered to men. This poorly translated verse is one of those used to support the erroneous concept that the kingdom of God is wholly spiritual; that it is made up of those who confess Jesus with their lips, regardless of what church affiliation they may have; that the kingdom of God is within every person in the sense that all have the potential of attaining the highest spiritual goals; and that baptism, the laying on of hands, celestial marriage, and other ordinances and laws are not essential to the attainment of salvation. Oh, Bruce. Is there anything you can’t turn into a reification of your authority? Rather threateningly, Jesus refers to the Flood and Lot’s wife as though they were real events — thus reaffirming that he still intends to kill a lot of people at his return. And that leads us to one of the first scriptures that will eventually be wound into a doctrine known as the Rapture. Two men in a bed? Two women grinding? Thunderf00t once had the opportunity to interview two members of the Westboro Baptist Church, and when the interview inevitably went south, he threw this in as a last chance to offend them. I’m posting this video, not because I’m a fan of Thunderf00t, because I found it amusing and relevant to the scripture. I actually find his anti-feminism off-putting and misguided. But here’s the clip. The relevant part starts at 15:52. I wonder if McConkie ever bothered to consult the oldest source documents for that "poorly translated verse" before declaring "the Prophet's" "translation" to be "the best of all." In my experience, when the church believes the Bible "as far as it is translated correctly," it means, "as far as it says what we want, and if it doesn't, we'll twist the meaning or just call it a bad translation without providing evidence to support that claim. Because authority." Exactly! So many times I've heard a difficult Bible verse explained away with, "Well, it must have been a mistranslation." But do they really care about how to find out when there's been a mistranslation? Strangely, they're never very concerned.